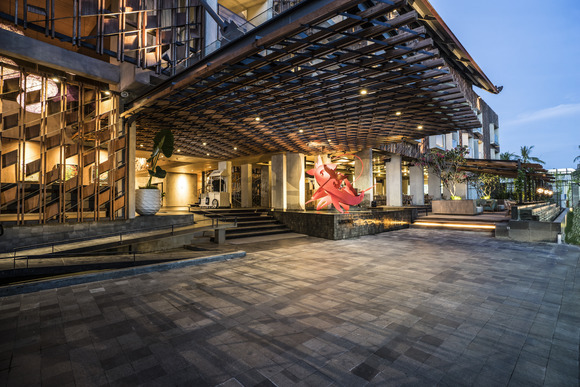 BALI, Indonesia—CSA Indonesia recently equipped several ARTOTEL Group properties across Indonesia with complete audio solutions from HARMAN Professional Solutions. Founded in 2010, ARTOTEL Group operates a brand of art-inspired hotels and beach clubs in many Indonesian cities, including Bali, Jakarta, Surabaya and more. To create unique and immersive atmospheres for its guests, each ARTOTEL features a specially-curated collection of artwork by local artists. In order to provide guests with premium audio quality for a wide range of areas, activities and events, ARTOTEL Group hired CSA Indonesia to outfit all of their properties with state-of-the-art sound systems. To ensure consistently superb audio experiences across all ARTOTEL Group properties, CSA Indonesia selected end-to-end HARMAN networked audio systems consisting of solutions by JBL, Crown, AKG, dbx, Soundcraft and BSS. CSA Indonesia installed an array of JBL Professional loudspeakers to deliver optimized clarity and coverage in the wide range of environments throughout ARTOTEL Group’s properties. To ensure powerful and intelligible sound for musical performances and events, CSA Indonesia outfitted the convention spaces with JBL EON Series speakers and SRX Series subwoofers, while JRX 212 speakers provide accurate stage monitoring. Versatile JBL AWC All-Weather Series speakers and subwoofers provide high quality audio for indoor and outdoor events. CSA Indonesia installed JBL Control 25AV compact indoor/outdoor speakers, Control SB2210 compact subwoofers and JBL 8128 in-ceiling speakers to provide elegant ambience in the hotel’s lobby, restaurant, bar and exterior areas. Events at ARTOTEL hotels and beach clubs benefit from the excellent wireless performance and sound quality of AKG WMS420 wireless microphone sets. For high-energy music performances, CSA Indonesia included AKG D5 dynamic vocal microphones, which delivers incredible gain before feedback to make vocals cut through any band mix. Finally, to ensure top-notch mixes at a wide range of large events and small functions, CSA Indonesia installed Soundcraft Expression Series digital consoles and EPM Series analog mixers.